Oceanfront 7 Bedrooms 5.5 bath, shared POOL with duplex. Tile floor in living area and kitchen. Fully equipped kitchen with stainless appliances including dishwasher, microwave, and refrigerator. Washer/dryer conveniently located right off the kitchen, plenty of TVs, DVDs, and Wifi. Large flat panel television in main living area and flat panel TVs in all bedrooms except kids bunk room. Sleeps up to 20 with additional sleeping in loft access. Bedding: 1st flr: Queen, Bunk Bed, Double. 2nd flr: Queen, Queen, Doube/Double, Queen bedroom with kids loft containing 2 double mattresses (loft has very low ceiling) only accessible via ladder access. Other amenities include a porch swing, porch furniture, sundeck (redone 2015), covered porch, enclosed hot/cold outside shower, charcoal grill. Pool with basketball goal, wireless internet access. This oceanfront beach home is only a 7 minute walk to the pier and town center. All bed and bath linens included and new mattresses. All beds will be made and bath towel sets provided for total number occupancy. pool area with additional decking and space for more places to lounge in the sun! Non-smoking, and no pets allowed. 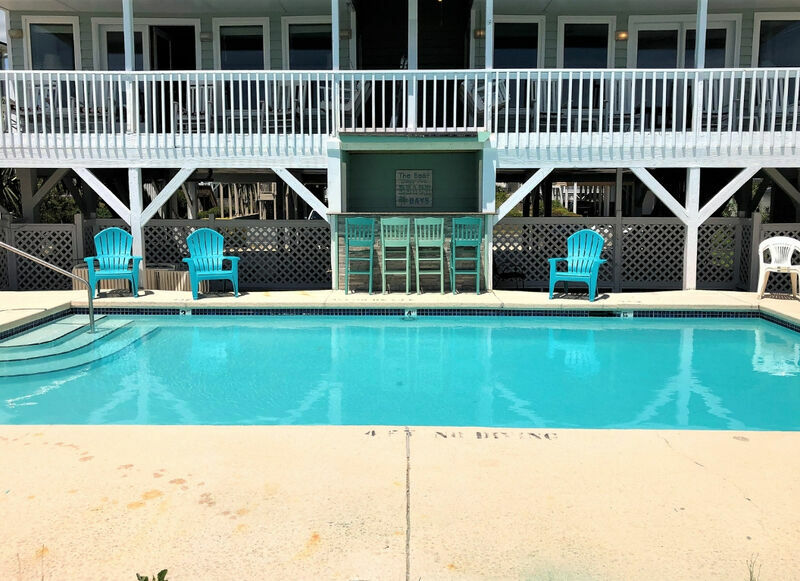 My family enjoyed the location of this property; There was a huge amount of deck space for plenty of people to sit, and the additional seating space by the lighted pool helped our family enjoy day and night. All of the mattresses had 2016 manufacture dates, carpet was new, and all bathrooms have been updated. Flat-screen TV's were thru-out the house, and the property is positioned where there is more privacy on the beach than most houses. The owners are up-dating the house every year. This year, we notice 2 new swivel-rockers, 1 new master dresser, and new pool furniture. We can't wait to return next year!!!!! GREAT TIME! !